When on your Andean adventure, there are several visitor sites you won’t want to miss if you are travelling south of the equator. If you read From Quito to Chimborazo Pt. 1 of this post, you are probably aware of all the beautiful things to see on your way to Chimborazo – the world’s furthest point on Earth from the planet’s core. 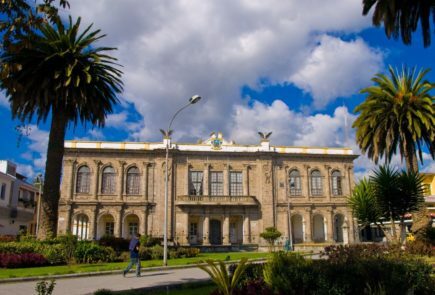 If you decide to stop in Quito before exploring the local highlands and heading to your Galapagos adventure, you will want to make sure you get the best night’s sleep and breakfast Quito has to offer by staying at Casa Gangotena. Located at Quito’s World Heritage colonial downtown, no other place will give you a better taste of this vibrant city’s Spanish and indigenous past. If you already followed some of our recommended visitor sites and are already at the base of Chimborazo, you can probably see the drive was worth it and the stopping in Quito was well-deserved. We hereby present you with a little more information about this impressive mountain and the different ways you can enjoy it. While driving to Chimborazo through Ruta Flores – the road connecting Ambato to the volcano – you will be amazed by the narrow cliffs and vibrant green that accompany you throughout the way. However, the best part is right at the end of the road, the moment you get to the Reserva de Producción de Fauna Chimborazo (Fauna Production Reserve Chimborazo). If you are lucky enough to arrive on a clear day, the 6,263 m (20,548 ft) colossus will be seen at the distance. 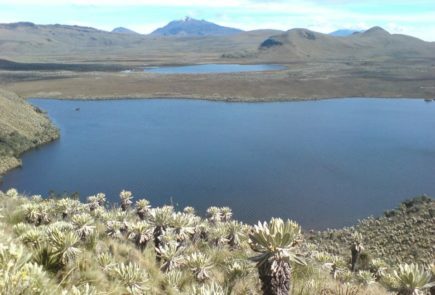 The protected system surrounding the mountain is home to unique wildlife, like llamas, vicunas, alpacas, foxes and flora species like the chuquiragua, the Ecuadorian Andes representative flower. El Arenal, the desert moor compromising most of the Reserve, is the only of its kind in Ecuador. Enjoy the ride and stop as much as you want to take pictures. The landscape will transform and show different facades at every turn of the road, one more photogenic than the next. This inactive volcano is actually comprised of two volcanoes, one on top of the other. It has four summits: Veintimilla, Whymper – the highest peak – Politecnica, and Nicolas Martínez. Its last known eruption happened some 1400 years ago, and eventhough it is considered inactive, geologists don’t rule out the possibility of another eruption in the future. The average time between eruptions has been recorded to be 1000 years. Until the 19th century, Chimborazo was thought to be the highest mountain on Earth, which is why geologists – also explorers and mountain climbers – attempted to reach its summit many times. The first to attempt to summit it where the scientists of the French Geodesic Mission, who were on a mission to determine the planet’s sphericity. They didn’t reach the summit. In 1802, the world-known scientist Alexander Von Humboldt, accompanied by Ecuadorian Carlos Montufar tried to reach the summit but got only as high as 5,875 m (19,274 ft). In 1832, Jean Baptiste Boussingault reached up to 6,006 m (19,704 ft). Finally, in 1880, English climber Edward Whymper reached the summit. In honour of his achievement, the route he took was named after him.